Well, this was pretty simple. Made it practically with the leftovers from my previous wallpaper. First I just made for fun, but it turned out somehow acceptable, so I thought +1 into my wallpaper collection never hurts, even if I cannot await hoards of favs for this. Guess I'm the first ever who tried a orange army camo, but is just as weird as a orange mecha is. Aspect ration has been changed to 16:9 and output is now in 4k. The Gouf vector has now better shades. Nice. Well done, very good quality. Its about time someone made a Gouf wallpaper! Very nice! 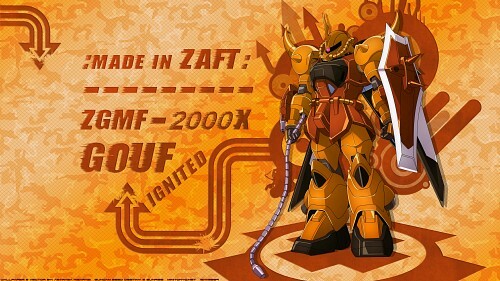 I love the gouf! Gotta love the colors here.